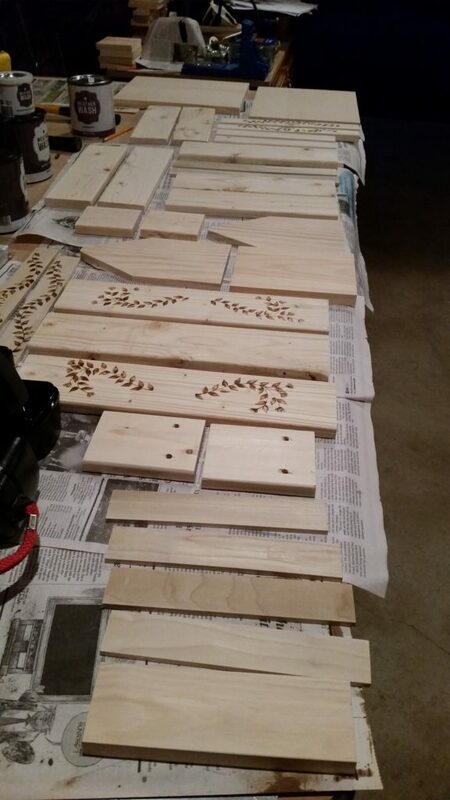 As promised, late, but getting done, I wanted to share pictures of some of the smaller pieces I’ve been working on. I had a bunch of leftover 1x4s from the bed, and some leftover 1×12 from the nightstands since I didn’t use it for the bottom shelves. I used it for the following, using inspiration from some of the AMAZING woodworkers I follow online and on Instagram. Completely unrelated is that my phone died. I lost some pictures, unfortunately, and I’m not quite over the learning hump with the new phone. I’m figuring out that some of the pictures I took with the new phone are on a super small setting and are blurring a little when I make them larger. Sorry, it’s not your eyes, it’s the pictures. 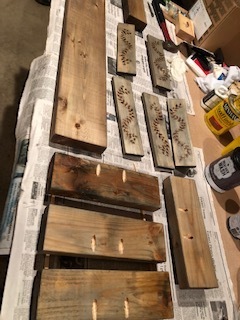 Here are pieces ready to be Weatherwashed for two trays, a centerpiece box, a wine tote and a beer tote. 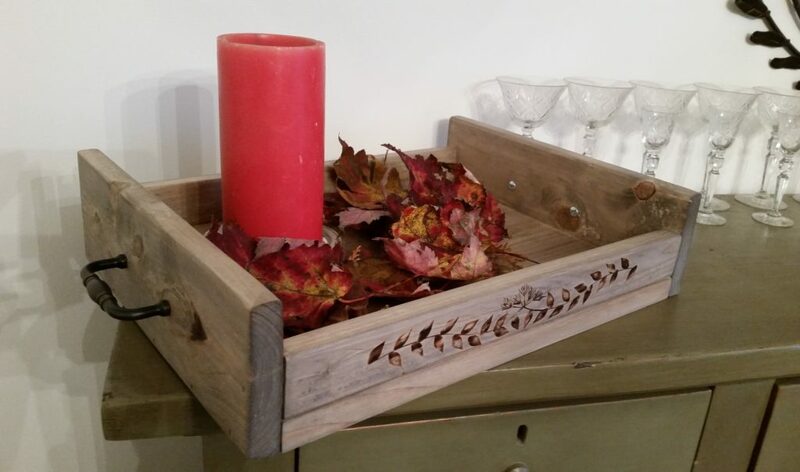 Below is one of the many display ideas I tried in a tray photo shoot. Here is the centerpiece box. I have battery operated pillar candles that I can picture in there with seasonal additions. 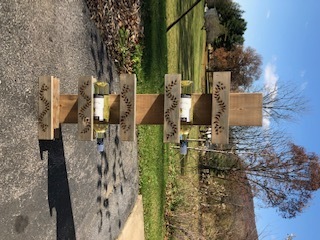 I also built a Shanty-2-Chic inspired wine rack. 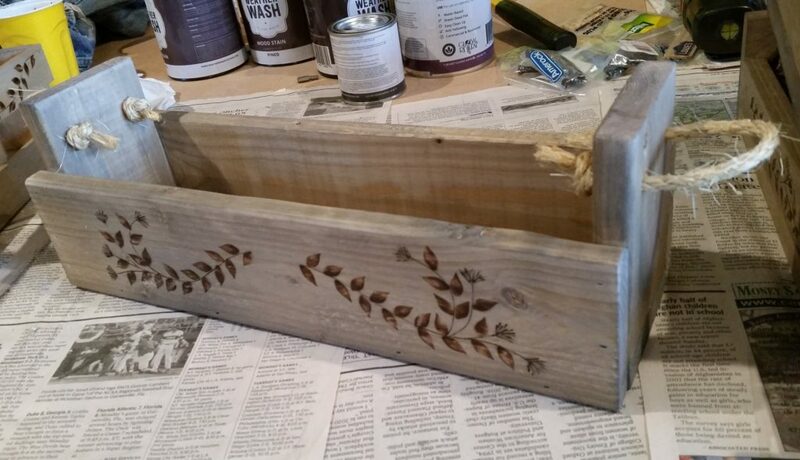 I used the Weatherwash Pined and Clear Maintenance Oil (I used it on the box above and the Rusted stain on the tray). I woodburned two designs, three of one and two of the the other. Lots of pocket hole action using the Kreg jig. Final product (with a very rare blue sky background)! And something really, really exciting is my early Hanukkah, Christmas, Anniversary present. 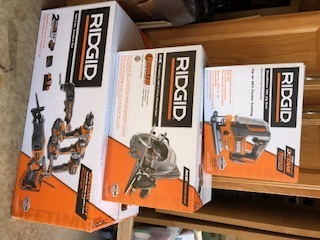 After a TON of research and review reading, I now own pretty RIDGID Power Tools! Still a few I want to add to the collection, but woooooooot!!! 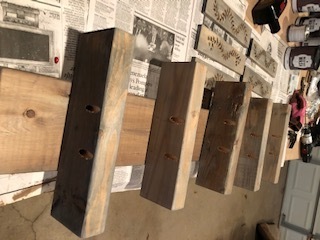 This entry was posted in Empty Nest, Hobby Adventures and tagged diy wood wine rack, empty nest, hobby adventures, making stuff with wood, RIDGID Power Tools, shanty-2-chic inspired, smaller wood projects, weatherwash by Mara. Bookmark the permalink. I love this. It could also be a floating shelf bookcase. The wood burning is getting so consistent! And I love how you’re branching out into other products. Thank you, as always. You are very sweet! Huh, it probably could be, for paperbacks. Interesting thought!